The perfect balance of readability and formalism. Joel Watson has refined his successful text to make it even more student-friendly. A number of sections have been added, and numerous chapters have been substantially revised. Dozens of new exercises have been added, along with solutions to selected exercises. Chapters are short and focused, with just the right amount of mathematical content and end-of-chapter exercises. New passages walk students through tricky topics. A wide range of interesting strategic behavior relates to the formation and enforcement of contracts, and Strategy breaks new ground by bringing contracting into the course, including coverage of verifiability, the hold-up problem, and option contracts. 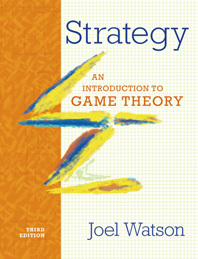 The text starts by emphasizing the key concept of a strategy, introducing games in the more intuitive analytical framework called the “extensive form.” After this brief introduction, students encounter games in the “normal form.” The development of concepts and applications proceeds from the simplest static settings (where normal-form concepts are utilized) to dynamic settings (with extensive-form solution concepts) to settings with incomplete information. 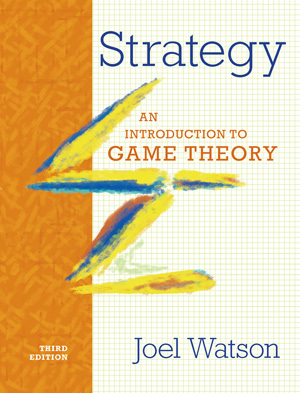 Game theory is best mastered by problem solving, and Strategy has numerous end-of-chapter exercises. The Third Edition includes dozens of new exercises and solutions to some of the exercises. The text also has one completely solved exercise at the end of each chapter to help the student comprehend the topics presented. The Third Edition has several new sections. Chapter 9 analyzes the Arab Spring of 2011 using game theory, Chapter 11 discusses randomization in sports and randomization in competitive pricing, Chapter 16 looks at the dynamics of competitive pricing with capacity constraints, and Chapter 18 discusses the “Coase Theorem.” These are in addition to several other new applications. Strategy also contains compelling discussions of strategic voting, bargaining in legislatures, cheap talk and legislative committees, information aggregation and voting, and the Hotelling-Downs median voter theorem. The Third Edition contains new coverage of weak dominance, conditional dominance, forward induction, continuation value/payoff, and the Nash bargaining solution.